Here's a gift for dinner parties to serve up your advertising message! The Cheese Board is made of renewable bamboo and includes a removable, non-porous tempered glass cutting surface for a great conversation starter when serving appetizers. This 12 7/8" x 5 7/8" board is hand-wash only and can be imprinted with a 5" x 2 1/2" decoration on the board or a 6 13/16 x 4 1/2" Colorfy full-color imprint on the glass to highlight any imagery or artwork you'd like to share. 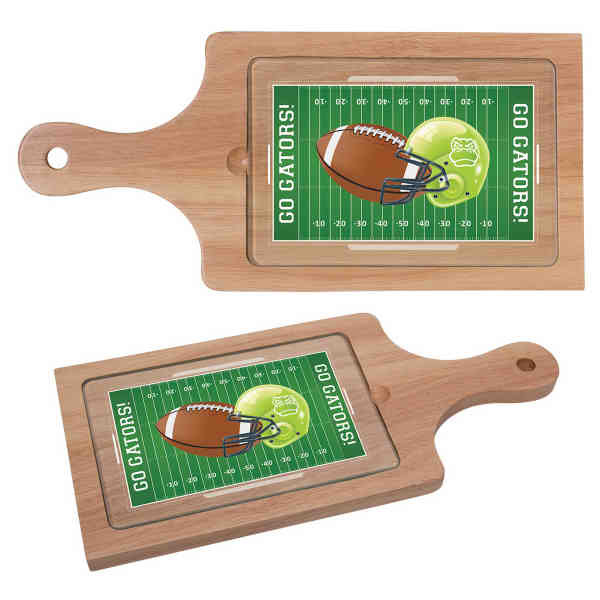 Create a game day serving plate, an essential for preparing meals, or a decorative display in kitchens for a constant reminder of your company. This giveaway is a cut above the rest! Size: 12 7/8 " x 5 7/8 " x 5/8 "
Ship Weight:12 = 18 lbs.